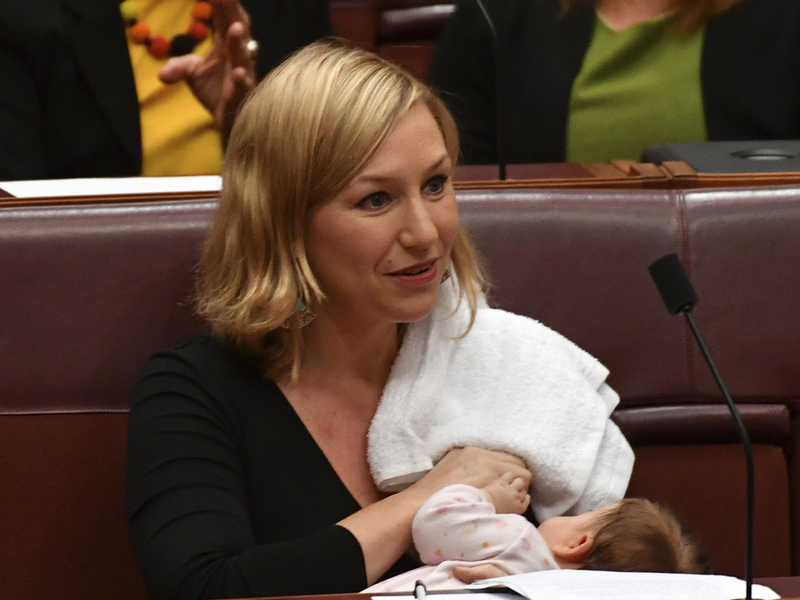 Senator Becomes First To Breast-Feed On Floor Of Australia's Parliament : The Two-Way Greens party co-deputy leader Larissa Waters is the first member of Parliament to take advantage of a rule change she spearheaded, allowing new parents to care for infants on the floor of the chamber. Australian Greens party Sen. Larissa Waters breast-feeds her baby, Alia Joy, during a session in the Senate Chamber at Parliament House in Canberra, Australia, on Tuesday. Years from now, a girl named Alia Joy will have a claim to fame to tell at summer camp: She was the first baby to be breast-fed on the floor of Australia's Parliament. Her mother is Greens party co-deputy leader Larissa Waters, who was returning to Parliament after giving birth to her second child, according to The Sydney Morning Herald. "The milestone comes after Senator Waters instigated changes to Senate rules last year, extending rules that already allowed breastfeeding in the chamber to allow new mums and dads to briefly care for their infants on the floor of parliament," The Australian reports. "The House of Representatives has made similar changes." Waters is the first MP to take advantage of the new rules. "If she's hungry, that's what you do, you feed your baby," she told The Courier-Mail. "I hope she doesn't squawk her head off too much, but she's probably going to be better behaved than many of the people in that room." Waters' partner "has scaled back his digital marketing agency to be a full-time dad," the newspaper reported. "He can bring Alia into the chamber when she needs some mother time." "Women have been [breast-feeding] in parliaments around the world... It is great to see it is able to occur now in the Senate," fellow Sen. Katy Gallagher told Sky News. "Women are going to continue to have babies and if they want to do their job and be at work and look after their baby... the reality is we are going to have to accommodate that." In 2009, another Greens senator, Sarah Hanson-Young, brought her 2-year-old daughter into Parliament — and the child was ejected from the room, according to the Herald. Last year in Spain, an MP named Carolina Bescansa breast-fed her baby in Parliament. The acting interior minister called it "lamentable," and a socialist MP called it "frankly unnecessary," according to the BBC. In Argentina, by contrast, a congresswoman breast-fed her child in Parliament in 2015, and a photo of the moment went viral. Perhaps the most famous parliamentary baby belongs to Italian politician Licia Ronzulli, who first brought her 7-week-old daughter to European Parliament in September 2010. In the years since, little Vittoria has been an enthusiastic presence, even raising her little toddler arms during voting. "It was not a political gesture," Ronzulli said when she first brought her daughter to a vote on a proposal to improve women's employment rights. "It was first of all a maternal gesture — that I wanted to stay with my daughter as much as possible, and to remind people that there are women who do not have this opportunity [to bring their children to work], that we should do something to talk about this."